Home » Charles I of England. King and Martyr. King Charles, 1600-1649, was from 1625 to 1649 King of England, Scotland and Ireland from the House of Stuart. His attempts to introduce a uniform Church constitution in England and Scotland and govern within the meaning of absolutism against parliament, sparked the English Civil War, which ended with Charles’s execution and the temporary abolition of the monarchy. An hour or two afterwards Charles was proclaimed king at Theobald’s, where the ministers had assembled, and on the following day he was proclaimed in London. Charles was then twenty-five years of age, and but for the influence of the latest of his father’s favourites, the violent, insolent, and dissolute Buckingham, might have come to the throne with a better promise of a peaceful and a happy reign. But while Buckingham supported the pretensions of the king for his own ends, Charles himself combined the Stuart shiftiness and weakness of character with the Tudor arrogance, and was soon ready to claim from the parliament what would not have been granted to Elizabeth, though a remarkable advance in the assertion of freedom had been made during the twenty-two years since her death. The nation had became conscious both of its rights and its strength, and the spirit of freedom kept pace with the growing wealth and intelligence of the people. 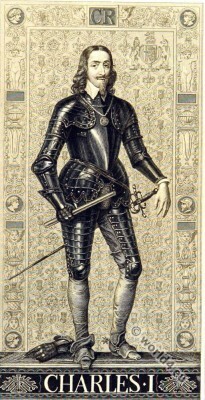 There was nothing in the personal character of Charles which entitled him to the place he has so long held in English history, but the circumstances of his position made him prominent. His combined weakness and assumption placed him in opposition to the great national struggle, which became imminent directly the divinely instituted right of kings to arbitrary power was reasserted. 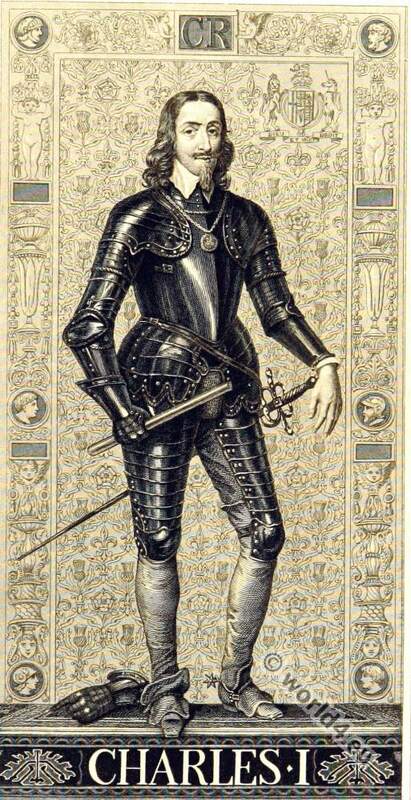 Had his end been less tragic, or the events of the contest less momentous, Charles would have been neither hero nor martyr. His public character has been made as it were to reflect the colour of the times by those who regard him as representing a certain principle opposed to anarchy, whereas, he represented no principle but that of autocracy and the aggrandizement of the crown. Had he succeeded, he would perhaps have attempted to drive the nation back to the time when it was declared that laws were concessions to the people from the monarch who granted, and was therefore above, the laws; and this theory might have been held, while in practice a considerable degree of national and personal liberty would have been obtained. The English people, however, had grown into a free constitution. They had no intention of struggling for concessions any more. They determined to have political liberty established and secured by measures which were effectual both with sovereign and subject. There is something in the character of Charles and in the real facts of the case to mislead a superficial observer, and at first to lend a certain plausibility to the attractive picture of him which the softening influences of time and the imaginations of his sympathizers have substituted for the real man. Every one is acquainted with the conception of him which is still perhaps the prevalent one in the majority of English drawing-rooms, as a stately English gentleman of the most refined tastes and habits, of highly cultivated mind, deep religious feelings, and the purest morals, who unfortunately entertained (or rather was educated into) notions of absolute authority, which were inconsistent with the predominant spirit of the age, though justified by precedents, and who, after making every concession,consistent with right to the exorbitant demands of his rebellious subjects, resisted them by arms in strict self-defence, and more than expiated any errors he had committed in his lifetime by his heroic and saintly bearing on the scaffold. Such a representation could be supported only by the widest deductions from the most imperfect premises, by a total disregard of all but a few isolated facts, and a violation of all the sequences and natural relation of events. The truth is that Charles was brought up in a court where the influence’s were coarse and peculiarly demoralizing, and that he observed a much greater decorum of life than had been displayed by James is so far to his credit, but it may be doubted whether a certain coldness and formality of temperament and a more cultivated taste had not a large share in this superiority. It seems difficult to believe that any man could retain the infamous Buckingham as prime favorite and close friend, and yet have a deep and practical moral sense. The errors of Charles’ character may perhaps be partially extenuated by remembering the associations of his youth, and the political crimes of which he was guilty may be referred to the self-importance which he learned from his father and from the tuition of the churchmen to whom his education had been confided. When he was a child his brother Harry, prince of Wales, was living, and he was kept in the back-ground till he was twelve years old. He was also weakly in constitution, and thus had learned to live much within himself, and so may have become reserved and uncommunicative. Thus disposed he would learn from his tutors, and the books to which they directed him, to look upon government as an absolute function of the sovereign. His education was casuistical, his way of looking at things had less relation to the practical duties and obligations of real life than to a narrow standard of conscience and self-assertion, to which those duties were subordinated. As he grew up his reserve was caused less by self diffidence than self-conceit. He evidently believed that he had a talent for diplomacy, while he was continually imperilling the nation by acts and words which showed no regard for the opinion or the claims of others. His belief in his own wisdom was little less profound than that of James. The overt act of a lie seemed frequently the best method of incommunicativeness, and the lying of Charles differed in this essential point from that of Elizabeth, that it did not represent any occasional or partial sentiment of his mind, but was entirely external to his whole nature, and was justified probably to his conscience by the casuistical argument that its perpetration was an essential agency in a policy which, as a whole, represented his real views, and, indeed, to his eyes, the cause of truth. Charles appears to have been incapable of seeing the falsity of his own conduct, or the results of his own arrogant demands, and so sanguine was his nature that it was only when he had lost all, that he gave up the direct opposition, and the tortuous plotting by which he sought to gain his ends. He was true, however, to his own autocratic assertions to the last, and there was after all a nobility in the man which enabled him to bear his reverses, and even to go to the scaffold with a high and dignified bearing. Reduced to complete inaction by inexorable necessity, he was saved from the consequences of his own ill-advised action. His self-confidence, which in prosperity assumed such an unamiable and unattractive form, exhibited,under these altered circumstances, all the aspect of dignified self-respect. His proud nature fell back upon itself, and the “wise passiveness” thus imposed upon him, became his greatest strength, and has proved the best foundation for his reputation in the eyes of posterity. The more complete the restraint, the more hopeless his prospects, the more helpless his “gray discrowned head,” the nobler became his bearing, the brighter grew his fame; until at last in “that memorable scene” at Whitehall, when every earthly hope had vanished, and all possibility of weak or unworthy plotting had ceased, he was more completely royal in his demeanor,and more worthy of our respect, than at any other epoch of his life. At that moment he dropped the cloak of a constitutional king, which he had hitherto affected to wear, and died with a steady eye and unfaltering tongue, asserting his real creed that “a share in government” is “nothing pertaining” to the people. Unluckily for Charles’ dignity in the eyes of his attendants and his ultimate welfare with the people, there was a contest of irritability too often going forward between him and his consort Henrietta, who was of a petulant and violent temper. When not offended, however, the queen’s manners were lively and agreeable. We are to imagine the time of the court divided between her majesty’s coquetries and accomplishments and Catholic confessors, and the king’s books and huntings and political anxieties, Buckingham, as long as he lived being the foremost figure next to himself, and Laud and Strafford domineering after Buckingham. In the morning the ladies embroidered, and read huge romances, or practised their music and dancing (the latter sometimes with great noise in the queen’s apartments), or they went forth to steal a visit to a fortune-teller, or to see a picture by Rubens, or to sit for a portrait to Vandyke, who married one of them. In the evening there was a masque, or a ball, or a concert, or gaming; the Sucklings, theWallers, and Carews repeated their soft things, or their verses; and “Sacharissa” (Lady Dorothy Sydney) doubted Mr. Waller’s love, and glanced towards sincere-looking Henry Spenser; LadyCarlisle flirted with the Riches and Herberts; Lady Morton looked grave; the queen threw round the circle bright glances and French mots; and the king criticized a picture with Vandyke or Lord Pembroke, or a poem with Mr. Sandys (who, besides being a poet, was gentleman of his majesty’s chamber), or perhaps he took Hamilton or Strafford into a corner, and talked not so wisely against the House of Commons. It was upon the whole a grave and graceful court, not without an undercurrent of intrigue. Bloody Mary, the daughter of Henry VIII. The English Civil War 1642-1649.